Miss Berry notifies Mrs. G. S. Lockwood that her letter and check for $50.00 dated for September 14th has just been received. She apologizes for not receiving the letter sooner due to her illness and her recent trip to Europe. Miss Berry extends her thanks to Mrs. Lockwood and to the Walnut Lane Schools for this donation as it will help the students towards completing their education. 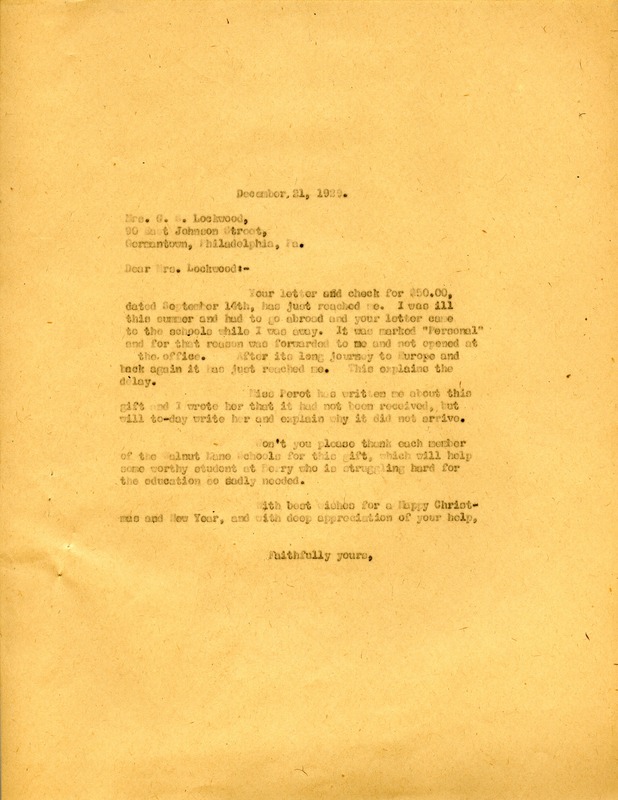 Miss Martha Berry, “Letter to Mrs. G. S. Lockwood from Martha Berry.” Martha Berry Digital Archive. Eds. Schlitz, Stephanie A., Jordan Brannen, Adriana Spencer, et al. Mount Berry: Berry College, 2012. accessed April 20, 2019, https://mbda.berry.edu/items/show/10521.